A UBC researcher says bridges built to meet current Canadian safety codes are being ‘overbuilt’ and may still suffer extensive damages after a major earthquake. A recent study by researchers at UBC’s Okanagan campus examined a variety of bridge types along with design requirements under the Canadian Highway Bridge Design Code. The study concludes that while bridges are being built to withstand the force of an earthquake—the bridges are being overbuilt and driving up unnecessary construction expenses. At the design stage, engineers determine a bridge’s seismic performance and predict damages—if an earthquake occurs—by calculating strains the material can withstand, explains UBC professor Shahria Alam. They must also make calculations for the probable post-earthquake functionality of the bridge. 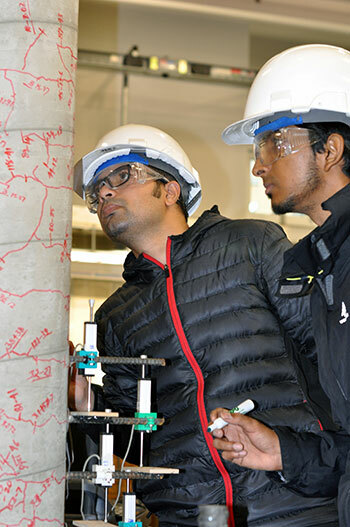 Test leader Mosharef Hossain, right, along with fellow UBC engineering student Rashedul Kabir, left, carefully inspect a concrete column after it has been put through a lengthy shake test at UBC Okanagan’s Applied Laboratory for Advanced Materials and Structures. Alam, who teaches civil engineering at UBC’s Okanagan campus, explains there are a lot of materials that go into bridges, and for years the common thought has been to add more steel reinforcement to make them stronger. However, research and structural testing in his lab and on a bridge pier in the Lower Mainland, is telling a different story. Under Canadian Highway Bridge Design Code, load, durability and seismic design—how movement during an earthquake will be dispersed within the structure so it will remain standing—are all part of the basics when bridges are planned. Alam is suggesting the code may eventually be revised. As part of their research, Alam and his team have been testing shape memory alloy reinforced, and post-tensioned bridge piers, in the Applied Laboratory for Advanced Materials and Structures (ALAMS) on UBC’s Okanagan campus. Alam’s team tested the seismic performance of such structural elements. The study related to seismic code was conducted by Alam and his student Qi Zhang in collaboration with MMM Group and was published in the Canadian Journal of Civil Engineering. The second study related to shape memory alloy reinforced bridge pier was co-authored by Alam and his former PhD student Muntasir Billah—now a bridge engineer with Parsons in Vancouver. The results were published in the Journal of Structural Engineering, ASCE. 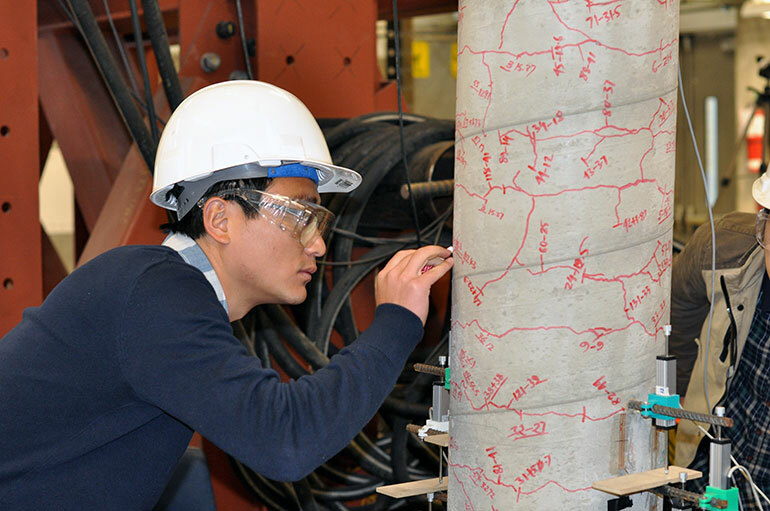 Student Peng Zhang traces cracks in the column during a strength test in UBC Okanagan’s Applied Laboratory for Advanced Materials and Structures.